Available in two lengths. Packaged in sets of four. 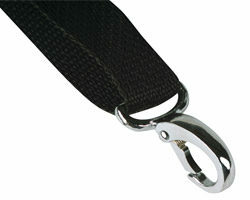 Constructed of strong 1″ black polypropylene webbing with heavy-duty nickel-plated brass snap hook and stainless steel adjuster buckle.